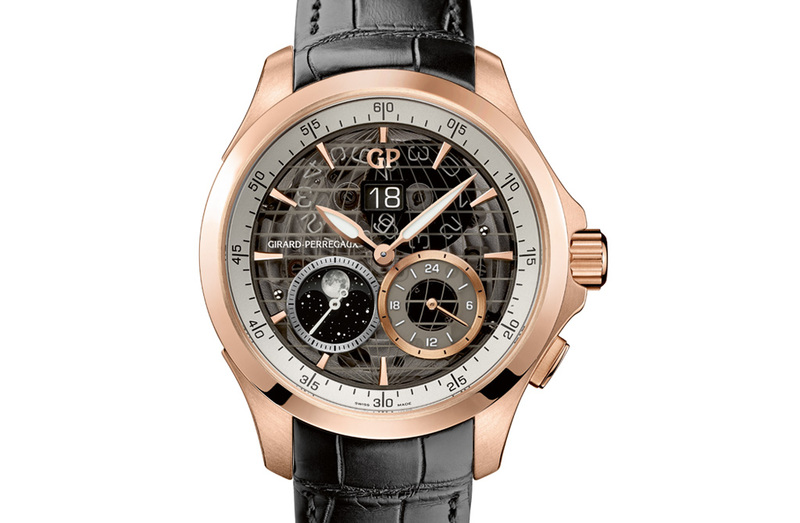 In 2014 Girard-Perregaux introduced the Traveller Large Date, Moon Phases & GMT, a sophisticated GMT timepiece targeted to international travelers and frequent flyers. We wrote about it here. Girard-Perregaux presents now the Traveller Large Date, Moon Phases & GMT in a new edition with a transparent dial which reveals the large date mechanism. This new Girard-Perregaux timepiece features three watch complications: large date, moon phases and second time zone. 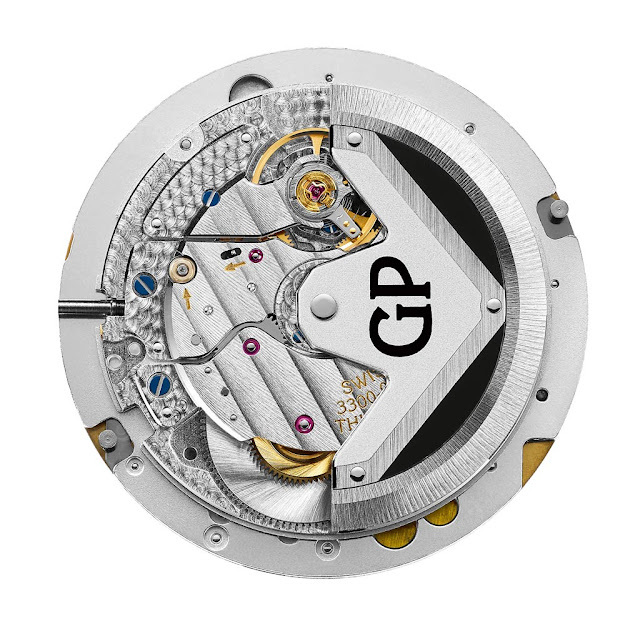 A patented solution, the large date mechanism is made up of two superimposed disks integrated into the in-house calibre. The juxtaposition of the disks, one of which is obtained from a transparent Folanorm sheet with a thickness of only 0.10 mm, ensures an aesthetically perfect display in which there is no visible separation between the two disks. Positioned between 7 and 8 o'clock, the moon phase representation is extremely realistic thanks to a special metallic treatment. 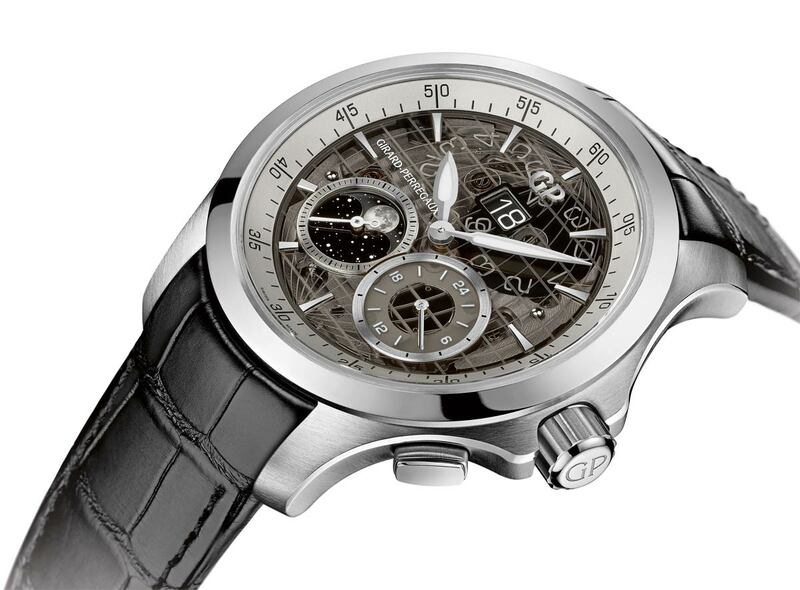 In this watch the moon phase indication is directly attached to the barrel for a higher degree of accuracy. Adjusted by a corrector button situated at 8 o'clock, it is surrounded by a circular satin-brushed ring and features a small second hand at its centre. 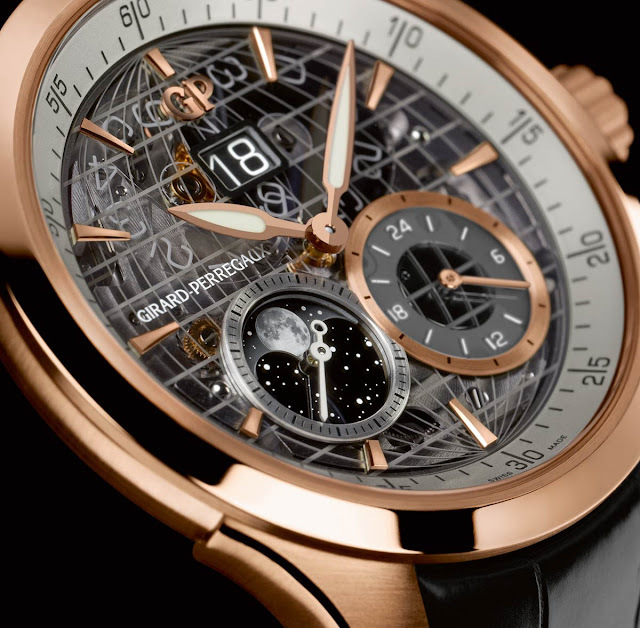 The information about the second time zone is provided through the sub-dial between 4 and 5 o'clock with the lines of the Earth's parallels merged into the sapphire crystal to highlight this useful function. Water-resistant at up to ten atmospheres (approximately 100 meters / 330 feet), the satin-brushed and polished case in steel or pink gold with a 44 mm diameter and a thickness of 12.10 mm houses the GP 03300-0109 automatic calibre. Visible through the transparent case-back, the movement guarantees 46 hours of power reserve and beats at a frequency of 28,800 vibrations per hour. Beautiful watch with useful functions. I would love a smaller version. Girard-Perregaux Traveller Large Date, Moon Phases & GMT with transparent dial. Girard-Perregaux presents now the Traveller Large Date, Moon Phases & GMT in a new edition with a transparent dial which reveals the large date mechanism. 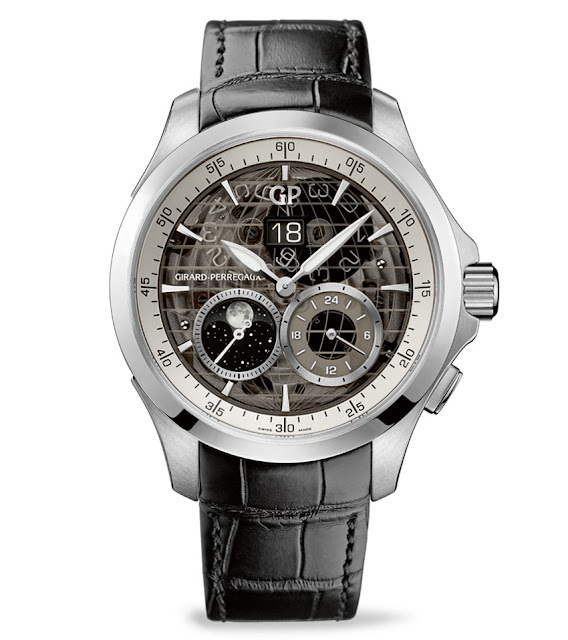 The new Girard-Perregaux Traveller Large Date, Moon Phases & GMT has a price of Swiss Francs 18,250 / Euro 17,800 / US$ 18,000 in stainless steel (ref. 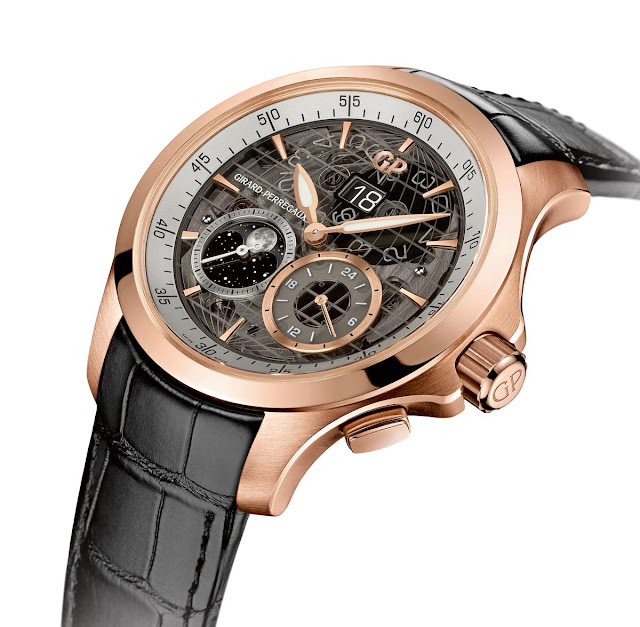 49655-11-231-BB6A) or Swiss Francs 34,900 / Euro 34,000 / US$ 34,000 in pink gold (ref. 49655-52-232-BB6A).